IF YOU ARE COMING HERE FROM FACEBOOK, CAN YOU PLEASE COMMENT AND TELL ME WHY THERE IS SO MUCH TRAFFIC COMING FROM THERE TO THIS POST? I have also written about Bifo’s The Soul At Work and Ironic Ethics. 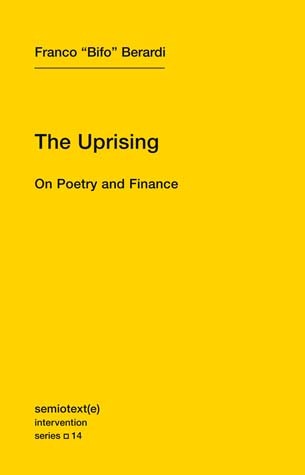 I finished the last hundred pages of Franco “Bifo” Berardi’s The Uprising: On Poetry and Finance last night. This post isn’t going to be a comprehensive review of the book–its manifesto tone and direct call for application resists summary. It is already concise, meant to be read out loud and in public; the stark yellow of the cover means that it wants to be seen. It is a book with a radical life that doesn’t pander. Bifo is a wonderful developer of concepts. Previously, in After the Future, he explained that we are living in a post-future period; we live in a world where the promise of the future has been shattered. It no longer exists, and we have to formulate new political identities to deal with this reality. As I read Bifo, the rest of his schema come out of that problem: how do we become politically effective when the very condition of the world exists to depress us and rob us of political effectivity? Like I said, this isn’t a comprehensive review; there are just some things from the book that I want to write about, or cite, or bring to broader attention. I’ll just do that. Semio-inflation, as a concept, gets at the excess of the contemporary period. I don’t mean conspicuous consumption. I mean the constant assailing of the subject with information and the cognitive adaptation that we undergo in order to live with that violence. The sheer plurality of meaning attached to every object, what we’ve lazily been calling postmodernism for the past thirty years, causes a chilling effect on political action. The swarm of signs and possible interpretations that surround objects mean that those objects are eternally receding from a direct politics–we can’t get a proper handle on things, can’t parametricize, because of semio-inflation. One way of short circuiting semio-inflation would be to assert material and vital qualities of beings. Taking into account concrete assemblages, and how they produce signs and semiotic systems, allows us to “deflate” and, while not getting toward Truth (because who cares), but at least getting toward an effective praxis. Sensibility is a psychic mode of absorption and interpretation that acts as a kind of damper toward affective and semiotic violence as it is directed at the subject; “sensing” is a way of bottlenecking, of closing the self in relation to the world. This is another way of getting at, and appealing to, a certain kind of materiality–it is a way of solving through semio-inflation. These are some concepts that I thought were rad. This entry was posted in Theory and tagged franco berardi, poetry, semiotics, sensibility, the uprising. Bookmark the permalink. — Who is this “we”? It certainly isn’t -my- “we”. Bifo is explicitly speaking to precarious laborers in Europe, but the project extends to everyone who was promised a future through unfettered capitalist growth. Its an inversion on Fukuyama’s end of history–whereas his argument is about the smoothness of growth and the lack of broken narratives, Bifo’s is about the impossibility of grasping a real, material future for literally billions of people worldwide. Here from Facebook. The link to your post has been shared here: https://www.facebook.com/franberardi?ref=ts&fref=ts — around 2000 subscribers, hence the traffic.